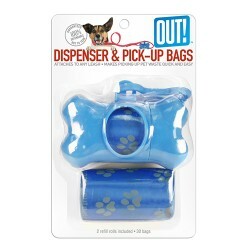 Product Details -Material - plastic material, Use-Trash Waste Garbage Disposable, Colors-Blue, Dimensions - 4x 11x 17 cm, Suitable -All Breeds Dogs. Product Information - These durable bags are easy to use and leak-proof, preventing unwanted messes. Picking up after your pet on a walk is easier than ever. Strong, leak-proof design. Dispensers attach to any leash. Any color will be shipped based on the availability.